While the trip down memory lane for June and July was fun, this month I was anxious to return to my goal of attempting to capture more emotion with my 2012 self-portraits. I feel like I've gotten away from that the past few months and wanted to refocus my attention with my portrait for August. In order to explain my motivation for this month’s image I have to share a bit of a confession…. I have never outgrown my obsession with teenage girly movies, and I have quite a collection of them. Not too long ago I was watching 17 Again, and there is a scene in it where they are cleaning up after a party. One of the characters is vacuuming off a rug, and when he finishes he says something like “All done,” and then as the camera moves out, he says, “with the rug,” and you see the entire rest of the apartment is completely trashed. That’s the look I was going for with August’s self-portrait. Kevin and I have spent the past several weeks searching for a new rental house, and packing up all of our stuff to move across The Valley. 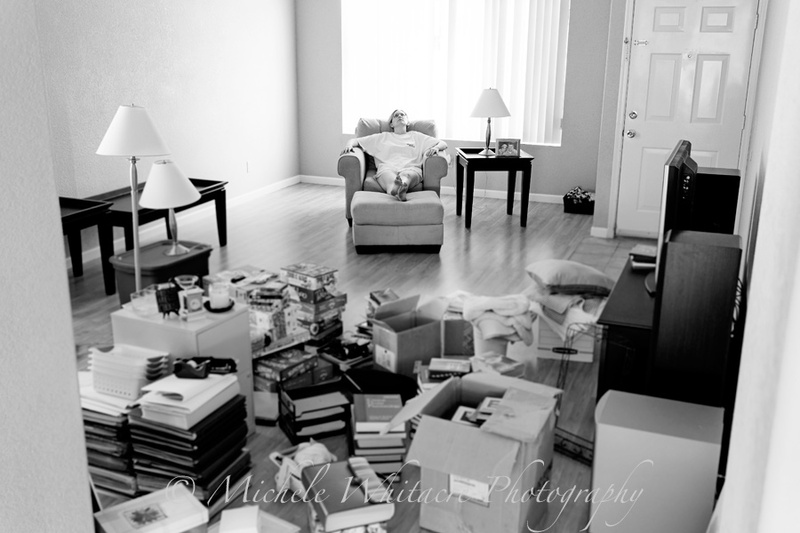 Instead of renting a huge moving truck and moving everything all at once, we decided to move as many of our personal belongings as possible in our cars and save the furniture for a smaller moving truck. Unfortunately our schedules are pure insanity and the belongings made it a few weeks before the furniture so we have been living out of boxes and sleeping on a (very small) futon mattress tossed on the floor. Things are totally insane for us because along with this move, Kevin has been taking summer classes and studying to take one of the huge tests he has to pass before he is able to practice law. As for me, I am starting work at a new office for my day job and also made the crazy decision to attend a 2 day photography workshop in the middle of moving (more on that soon!). Needless to say, things feel a bit out of control at the moment and I really don't deal with that feeling very well! So, here I am in the little oasis that I have managed to create for myself amongst the mass chaos that is my world right now. As a side note, I totally love how dirty the bottoms of my feet are in this image. It absolutely wasn't planned for the image, but I cannot tell you how black my feet are by the end of the day while cleaning and moving into this new rental house. It's rather disgusting the state they are in, but such a HUGE memory of this move for me! I have to admit that my exhaustion in this photo is real, since I set everything up for the photo and then realized that my remote battery was dead and I hadn't moved the spares from the old house yet. So, I was literally pressing the timer on my camera and hurling myself over all that junk to get to the chair before the shutter went off. What a fun post! I remember that overwhelming feeling when I moved into my house. I never thought I'd get everything unpacked, and yet, I did! Hope you're all settled in now! Oh what fun! Wish I was close by to offer another pair of hands. Looking forward to seeing your new place in Sept.